Inspired by Lucinda Douglas-Menzies’ photo essay on the Victoria Model Steam Boat Club, I walked over to Victoria Park yesterday to meet Keith Reynolds, the secretary, a sympathetic man with an appealingly straggly moustache, who had agreed to let me take a look at the club’s photographic collection. So, as the members got steam up on the lakeside, I sat inside the club house and sifted through the archive, listening to all the variously enigmatic whistling and chugging sounds coming from the shore. 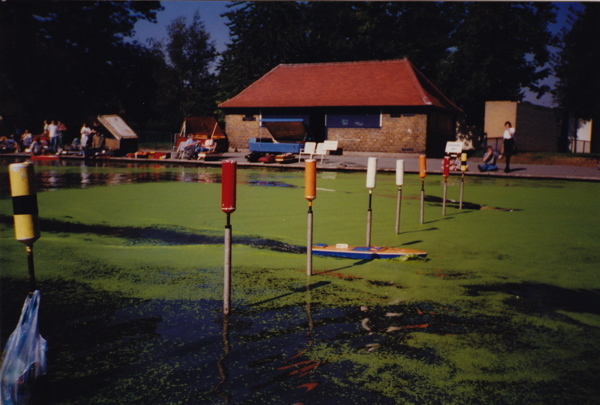 Keith told me that the club existed even before the founding of the Model Steam Boat Club in 1904, preceded by a Model Sailing Boat Club that he believes was founded in 1875. The venerable club house dates from this period and Keith showed me where the lockers once were, custom-built to store huge model sail boats, before the age of steam took over. There are just a handful of early black and white pictures, donated years ago by member Olive Cotman. The photograph above is from January 3rd 1937, but the earlier one at the top is tantalizingly undated. 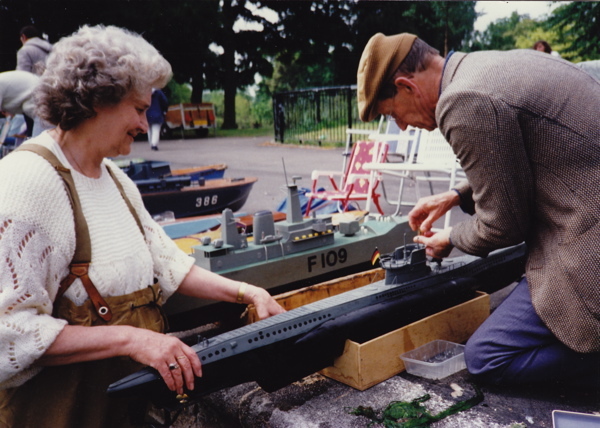 As well as the impressive display of model boats in both photographs, the members display a fine selection of hats, and in the top picture, if you look closely, you can see the pennant-shaped club badge pinned onto many of the caps. 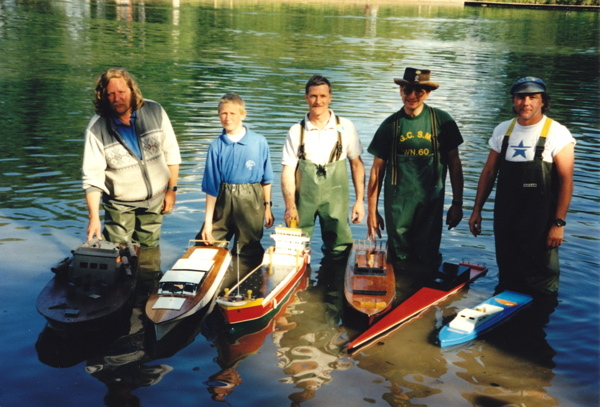 The dignity of these men, so serious with their moustaches and caps yet so proud to be photographed with their fleet of model steam boats, is very touching. 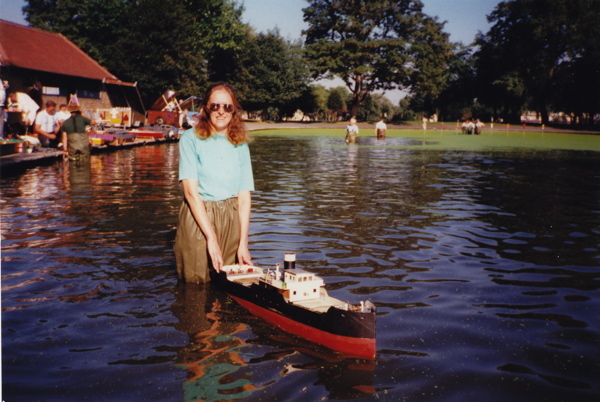 I presume these boats were miniature versions of the vessels that you might see a mile away on the Thames at that time. 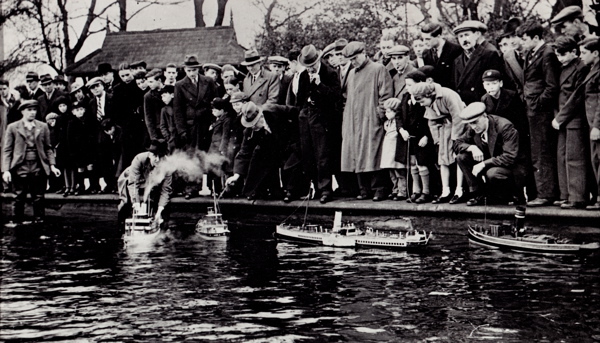 By contrast, the diversity of the 1937 picture draws you into a relationship with individuals in the crowd, who braved the chill wind of Victoria Park in January to watch the model boats. The anonymous schoolboy in his cap is more interested in the camera than the boats, he gazes towards us and into eternity. As I looked through the many thousands of photographs from the modern era taken by Janet Reynolds, Keith’s wife, over the thirty-five Summers since their marriage, I became fascinated by these idyllically beautiful colour pictures which tenderly evoke so many long happy Sunday afternoons. I realised that I was looking at images of the younger selves of those same members of the club who I had been introduced to that morning. 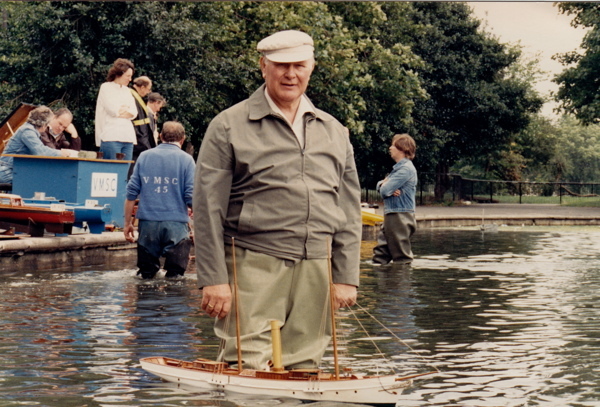 Keith has been sailing steam boats for fifty years – since he was ten, although he had to wait until he was fourteen to become a full-fledged member in his own right, in 1964. One day Keith’s father stopped by the lake to speak with the father of the current chairman Norman Lara, and that was how it began for the Reynolds family, which has now been involved for four generations. 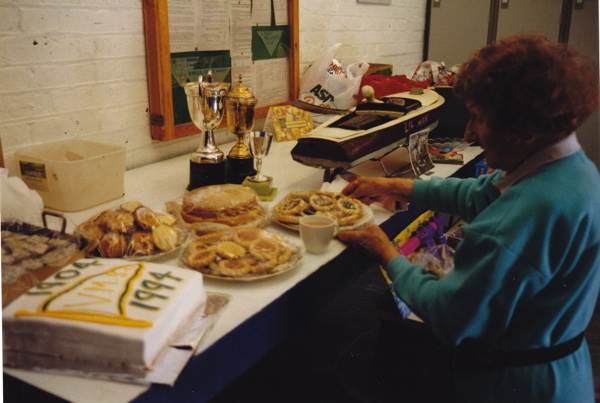 “She married into the Boating Club,” admitted Keith affectionately, referring to the induction of his wife Jan, “She took photographs because she didn’t want to boat, but then she decided it was more fun to get involved, and now my daughter and my grandson of fourteen are also members.” I was intrigued by Keith’s statement, revealing the narrative behind these lyrical images, which were taken by a photographer who became seduced by this diminutive nautical sport, embracing it as a family endeavour to entertain successive generations. Out on the shore, Keith introduced me to the engineer Phil Abbott who showed me the oldest vessel still in use, a steam-powered straight-racing boat with the chic melancholic name of “All alone” from 1920, beside it sat “Yvonne” a high-speed steam-powered straight-racing boat from 1947. 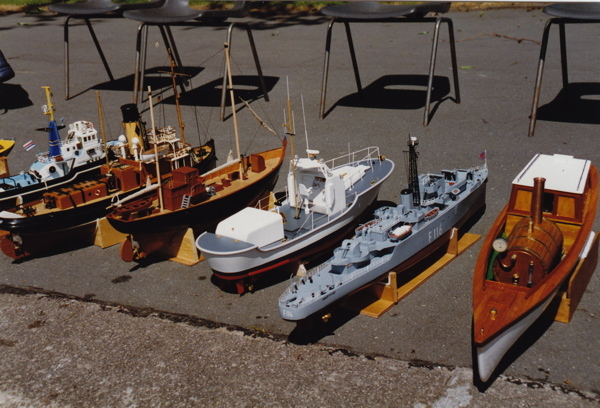 These boats speak of the different eras of their manufacture,“All alone,” with its brass funnels and tones of brown with an eau-de-nil interior, possesses a quiet twenties elegance in direct contrast to the snazzy red and beige forties colour scheme of the speed boat, that raises its prow arrogantly in the water as it roars along. “All alone” was made by Arthur Perkins, who offered it to the club, as many members do, before his demise. “Yvonne” has a similar provenance. 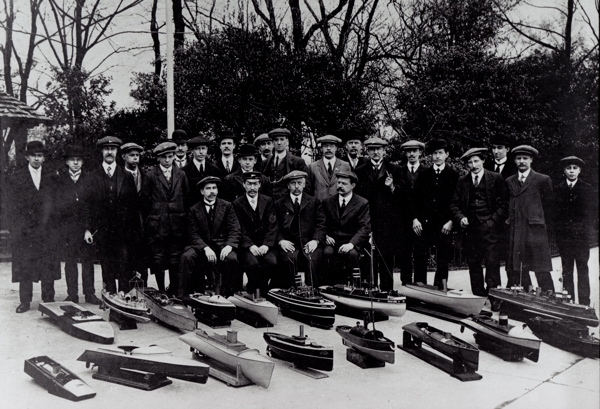 And when Keith explained that he had acquired half of the thirty-seven boats he possessed, making the others himself, I began to wonder if perhaps the focus of the club was the boats rather than the members. 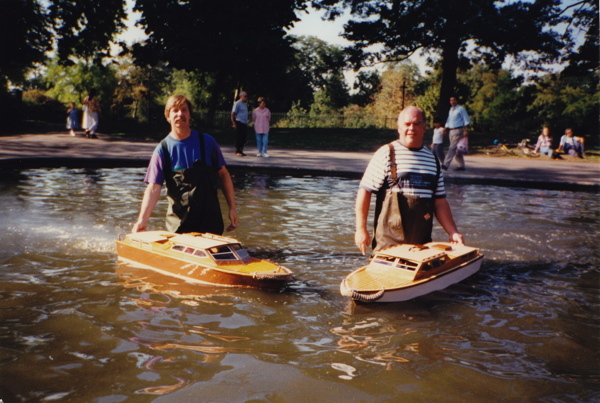 They are in effect mere custodians, providing maintenance for these vessels, enabling them to sail on, across Victoria Park Boating Lake, over decades and through generations. Keith pinned a blue and white pennant-shaped enamel club badge on my shirt, just like those in the photo at the very top, and confessed that the club is eager for new members. 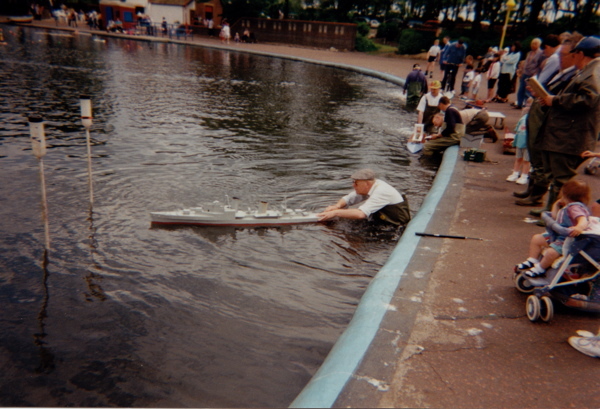 It does not matter if you do not have a boat, anyone is welcome to join the conversation at the lakeside, and guidance is offered if you want to buy or make your own vessel, he explained courteously. 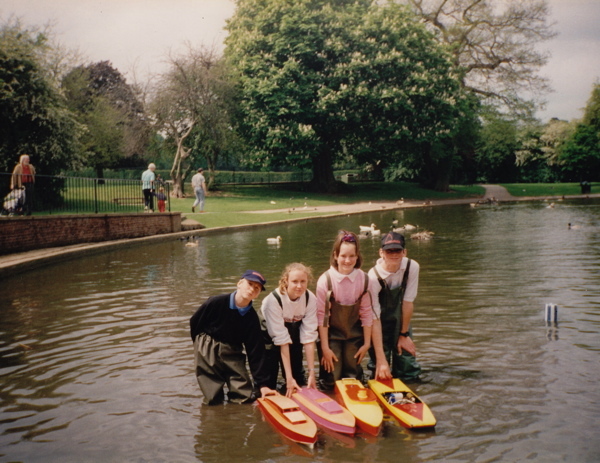 It would be the perfect excuse to spend every Sunday boating for the rest of your life and you would be joining the honoured ranks of men and women who have pursued this noble passtime since 1904 on the lake in Victoria Park. These treasured photographs speak for themselves. Have read with great interest, and love the photographs and history behind your club.maybe you can help, I am trying to find out more about my grandfather, he was a member of your club……EDWARD GODFREY. Won 1936 prototype cup, 1913 model engineer.